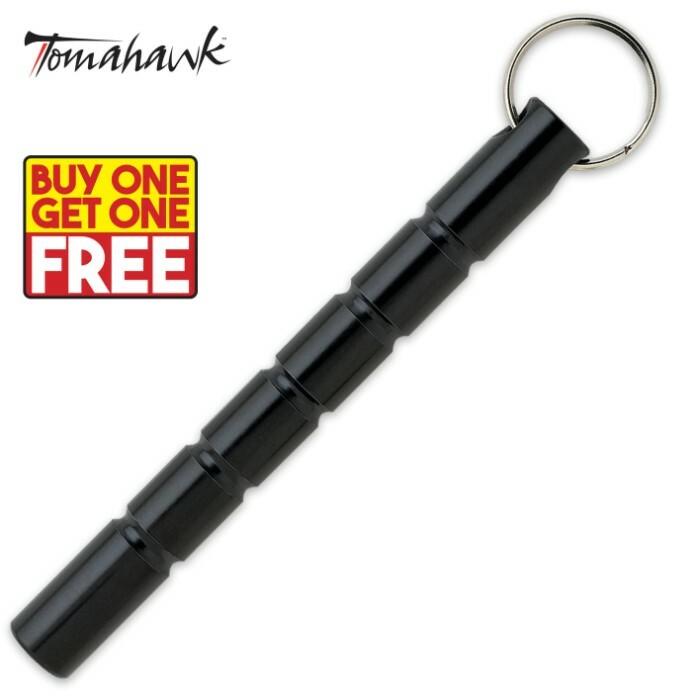 Black Aluminum Flat Kubaton Keyring 2 for 1 | BUDK.com - Knives & Swords At The Lowest Prices! Kubaton keyrings are ideal close-quarter self-defense weapons. Depending on the manner held, the Kubaton keyrings can be used to deliver hammerfist strikes, pressure point attacks, hardened fist punches, or metallic flailing attacks. Grooves add increased grip. Whether you use it as a standard keyring or for personal protection, you will walk a lot safer with the Kubaton keyring in your hand. This is a great little piece to add to your self-defense arsenal. Especially for the women in your life. It adds that extra punch, and it's easy to conceal or make part of your everyday key ring. Definitely buying more.